We are pleased to announce further details about our Lucky 13th Annual Mini Open Evening on 8th July 2014. We have kept the usual favourites in the mix. Everyone who attends will be eligible for discounted parts on the night, and of course the first 100 people in a Mini car will get free food vouchers. In addition, we will also have a roaming magician on site to amuse us all. Just call him over and prepare to be entertained. You will also see our professional caricaturist who will be with us from 6pm onwards. We expect this to be a very popular attraction, so please enquire early to avoid disappointment. This year, everyone is a winner. Each Mini Car that comes on the night will get a small goodie bag free. This will be issued as soon as you arrive. We may also take that opportunity to take a snap shot and get some details from you for a planned Open Evening Year Book. We have gone all out to bring you the best competitions and prizes to date. The first 100 Minis will be issued with a scratch card free of charge to be in with a chance of winning a set of Car Mats that will be ordered and personalised to your car. Win 2 tickets to Bingley hall by making sure you get in our photos! That’s right; the Face in the Crowd is back after a popular reaction to last year’s competition! Spend over £50 and get a free Mini Spares cooler bag with Mini Spares goodies for your car. You must spend the £50 on the night to qualify. We will shortly be updating our official Open Evening Facebook page with updates, so make sure you confirm your attendance to receive updates. The Classic Mini never ceases to fascinate. Considering there is fundamentally one shape of car, the variants and customised versions available are endless. At Mini Spares Midlands, we see Classic Mini cars every day, especially during our Annual Mini Open Evening where over 100 of our customers Mini Cars can turn up – Read more about this here! And yet it is still special when we see something a little different, and this was certainly a new one for us. At first glance, this Open Sided Mini with fairground style protective bars seems like it has been customised for a reason and has been kept for nostalgia purposes only. It’s only when we delve deeper into the history of the car with the owner; we find out that it has quite an extraordinary history attached to it. When the car was built, it was originally planned to be a Morris Minor until a total of 35 customised open sided Mini’s were commissioned for promotional purposes. Parts of the engine still show this to be true. The wicker seats were specially designed and built for comfort and practicality whilst being able to withstand the exposed elements. (52 years later, they have certainly done the job). This is the last of the 35 Mini’s of this kind to exist in the UK, so what about the rest of them? As far as we know, 2 exist in the US and 1 refurbished version exists in Greece having narrowly escaped the scrappage scheme in 2009 (similar to the new car incentive we had in the UK). Infact, the Greek open sided Mini was plucked from the scrap yard before total annihilation and painstakingly refurbished back to its original glory by its proud owner. Even the wicker seats have their own story. The man who designed the originals was tracked down in the UK. Now in his 80’s, his young apprentice followed instructions of the original designs to keep it as authentic as it could possibly be. 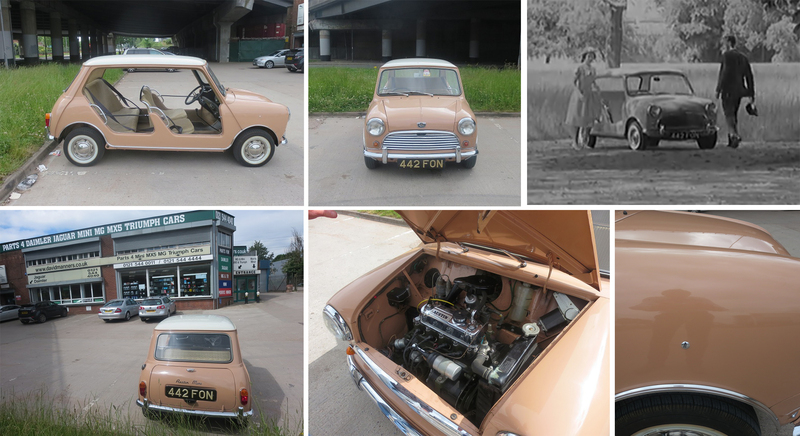 Since 1962, this Mini has only covered a total of 7,500 miles and still boasts its original paintwork. It has been well looked after from new and has only had a handful of owners. But it’s the cars first owner that makes it so special. The car was originally owned by Queen Elizabeth II in 1962. The Mini, with its original registration number can be seen on old Pathe news reels looking no different to what it does today. Apart from the Union Jack flag that is. Infact, the hole where the flag once mounted on the right front wing still exists with a chrome plate covering it. The Mini has been with its current owner for several years now. It originally ended up back in the hands of Austin so was well stored for several years until a clear out of assets meant the car traded hand for little more than £50. The car is used sparingly today but is available to see at Mini shows across the country from time to time. In the short time it was with us at the David Manners Group, it had already drawn a crowd from passers-by. The Jaguar XK8 is one of our most prolific customer cars here at the David Manners Group especially with our trade customers. So we never miss an opportunity to bring you pictures whenever possible. The XK8 is fast becoming a Modern Classic in the Jaguar Family with many of the cars we see kept in pristine condition by their owners. 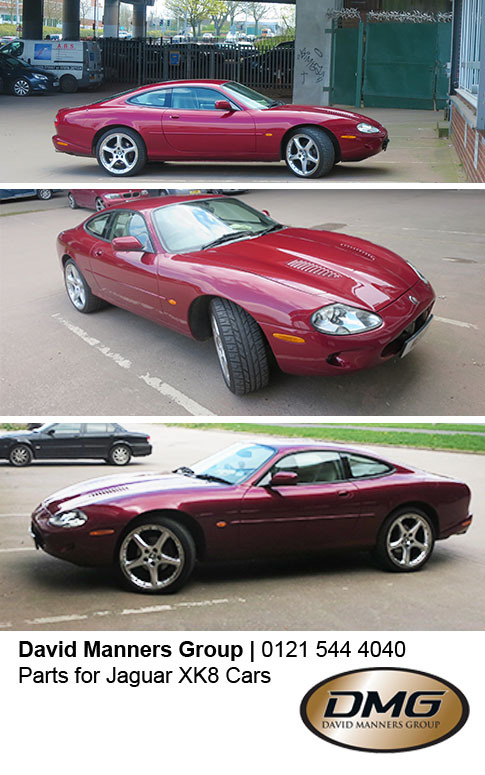 Launched in 1996, the XK8 is hardly old in the sense its status has been retired to Sunday outings, so you will still see plenty of the earlier versions on the road. And because they are used on a regular basis, we have no trouble stocking parts for next day delivery – it’s important to get the car back on the road, right? Especially if it’s your daily commute. Our customer and close friend of the company Quentin Willson is a well-known Classic Car enthusiast. Quentin’s collection includes a Classic Mini and E-Type Jaguar and he knows first-hand how important it is to us to stock parts on our shelf where other companies rely on their suppliers to hold stock for them. Quentin has fully restored both his Classic Mini and E-Type Jaguar exclusively from parts we stock, not to mention his Daimler Dart SP250. It is therefore no surprise that he has mentioned us in his blog on several occasions including an article on the Jaguar XK8 that can be seen here. In the article, he goes on to say that the XK8’s prices are very reasonable for what you actually get – combination of reliability and style. This may be one of the reasons it is one of our most popular cars to stock parts for. DVLA stats show that they are not decreasing in numbers as rapidly as you would think. The XK series was fairly well received in 1996 and popularity has steadily grown since. You can see more of our customers Jaguar XK8 cars as well as our other albums by visiting our Pinterest page by clicking here. Our good frien d Nicolas Pinon is quite a figurehead in the Classic online community. 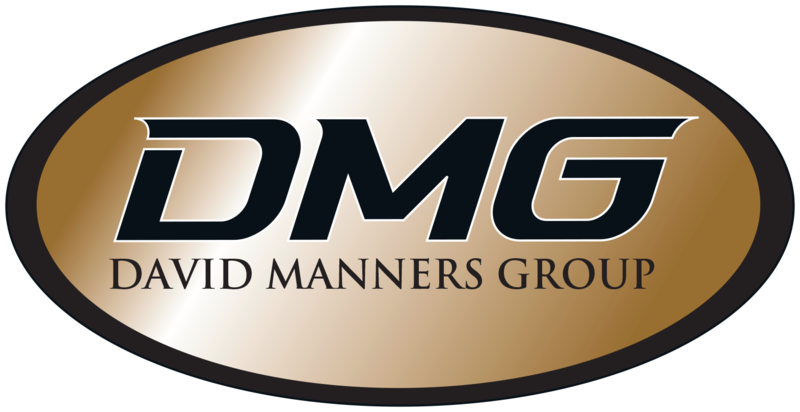 He is a regular customer and friend of ours at the David Manners Group and has built many of his cars exclusively from our parts. Amongst his fleet, he boasts a small collection of Classic Mini Cars. Last year, we highlighted one of his award winning Mini’s shortly after it triumphed at the Birmingham NEC Car Show. To see more of Nicolas Pinon’s cars, visit his Facebook page here where he has photos showing restoration projects from early stages of development right through to the finished articles. A few weeks ago, we once again caught up with Nicolas on his latest journey from France to England. He stopped by at the David Manners Group Head Office for some parts and to take some shots of our team at work for a film he had commissioned following his journey across the country. You can see the video on YouTube by clicking here. The film documents Nicolas bringing his Mini into the UK in preparation for its race track exhibit and features a whole host of other wonderful classics along the way. 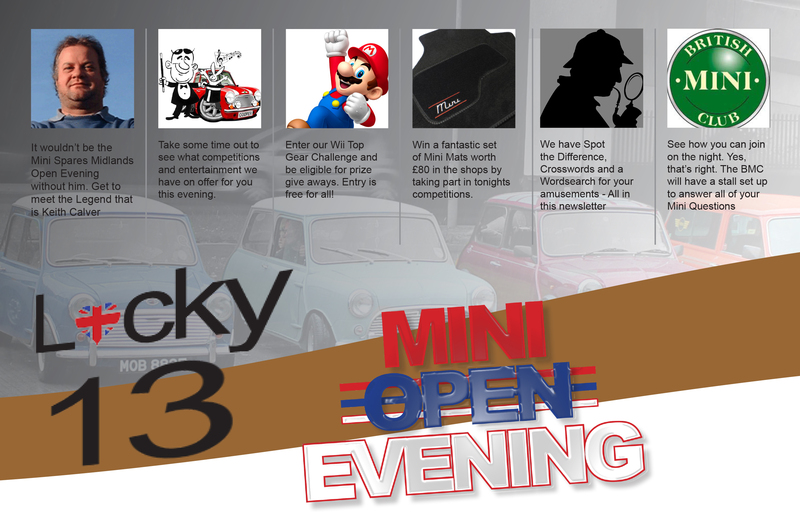 The 13th Annual Mini Spares Midlands Open Evening will be held on Tuesday 8th July from 6pm onwards. We aim to make this event the best of the lot and have a host of new and exciting events that will make the evening enjoyable for everyone who attends. We have kept the usual favourites in the mix. Everyone who attends will be eligible for discounted parts on the night, and of course the first 100 people in a Mini car will get free food vouchers. More details of the evening will be revealed soon. As we don’t want to give too much away, stay in touch by visiting our Facebook Event page where you can confirm your attendance and keep up to date with details as soon as they have been released. Many thanks to the British Mini Club as always who have once again shown their support and worked with us to bring another fantastic event to the Mini Calendar. You can see pictures of last year’s Mini Open Evening by clicking here. Remember, if you see yourself, tag yourself. On Sunday 8th June 2014, 5 of our elite sales force finally took to the road in support of the Pedal for Parkinson’s charity ride. After weeks of preparation, over 140 miles was covered by our cycling team with captain Steve Travis opting for the difficult 60 mile circuit, completing in just 5 ½ hours. Led by our Sales Manager Steve Travis, our guys started training for the circuit which covers the beautiful Warwickshire countryside only 5 weeks before the cycle date, but the demands of the terrain required consistent preparation in this short time before finally tackling the route. Steve had already been training 6 months in advance in preparation of the 60 mile bike ride which was particularly tough through the winter months. However, after we signed up to compete, the challenge was motivation enough to continue. Our competitors who chose the 20 mile route, all looked out for each other starting as a group and crossing the line together in just under 2 hours offering support in what may have been the hottest day of the year so far. Extra support came from other members of the DMG team who ensured our cyclists were aware they were being supported every step of the way by coming alone to cheer them across the line. Many of our customers, family and friends have very generously donated to our Just Giving page ensuring we have already reached our goal. But we are still collecting donations if you wish to spare change. Please click here to view our page to donate and see our testimonials. Special Thanks to our competitors who rose to the challenge, Steve Travis, Paul Grainger, John Erra, Stephen Brooker and David Woakes. 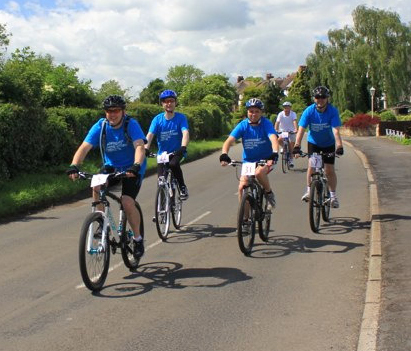 You can see more pictures of the charity bike ride by visiting our Facebook page here. The Triumph Spitfire MK3 was in production over a 3 year period between 1967 and 1970. Official figures show that just over 65,000 units were made in total. According to the DVLA, only 270 are on the road today. The MK3 Spitfire is indeed a rare site now so it’s little surprise most examples such as our customers here are well looked after and renovated to concours standard. DVLA figures also show a rise in SORN numbers, which is usually an indication of an increase in restoration projects. 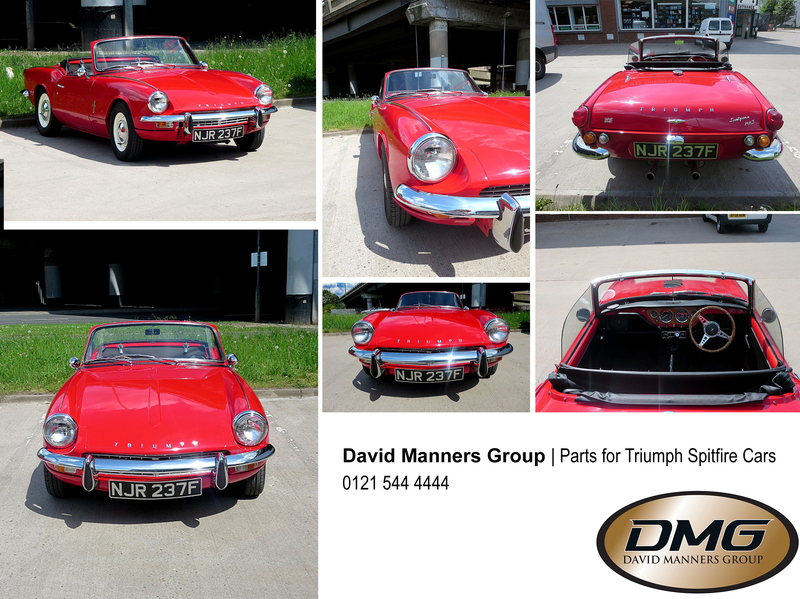 This 1967 Triumph Spitfire has been mainly refurbished from David Manners Group parts and our ability to source some of the more rare items that are not easy to get hold of. You can download a free Price list for the Triumph Spitfire from our website by clicking here. You can also download our Triumph Spitfire Spares Catalogue from our website here, or call 0121 544 4444 for your free copy now.